Social media is a great thing. It brings the world together and helps keep friendships alive amidst distance and busy schedules. However, there are also some downsides to social media. Facebook and Instagram have recognized this and are out to help be part of solution, not the problem. The average person spends roughly 3 hours on social media each day - most of that time is spent scrolling through news feeds. If the average person spends roughly 16 hours awake each day (averaging 8 hours of sleep), that means that one fifth of their day is dedicated to social media. At first read, this sounds like a positive thing, but really what this means is that people are constantly bombarded with perfect pictures of friends living seemingly exciting lives or in the perfect relationship and it causes them to think less of their life experiences and relationships. Studies have shown that large amounts of time spent scrolling through social media has actually led to feelings of increased anxiety and low self-esteem. 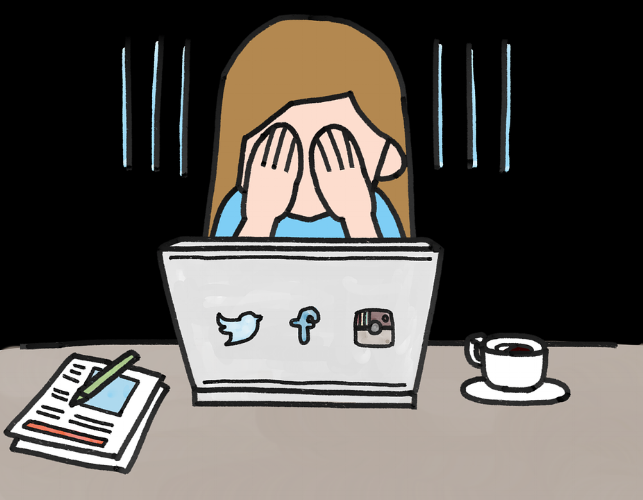 There’s even a name for it - Social Media Anxiety Disorder. On the opposite end of the spectrum, social media can also lead to vanity. Constantly taking selfies and posting the best version of someone online only to receive hundreds of likes is a great self-esteem boost. However, people can become so obsessive over finding the perfect picture of themselves that they become self obsessed, or vain. If a person is constantly thinking of the next great picture, or the next great outfit they can wear they are focusing purely on what others think of how they appear online. This can lead to a distorted perception of reality. It’s great to post stories and take videos of that great concert or stop mid lunch to take a best friends pic. In fact, doing those things can enhance people's enjoyment and appreciation for the moment. Photos and videos are a great way for people to look back on years later and remember the moments of their younger days. However, when every second of a person's life is experienced via Instagram stories or pictures, they aren’t really living in the moment. While the solution may not be totally figured out, life is all about finding the balance. Too much of anything can be a bad thing. Facebook and Instagram want to help their users to recognize how much time they're spending scrolling through a news feed and has released a new update that can help monitor that. With this new update, users will now be able to set a timer on the app for a specific amount of time that they are willing to scroll through the app. The timer will go off when you’ve reached the time limit. This will help users to make a conscious choice in regards to checking out their feed or making a post. Additionally, this new tool will allow the user to mute notifications for certain amounts of time (although we at The Sitch recommend leaving your notifications off at all times in order to totally take control of when to scroll). In an interview with Facebook (who owns Instagram), CBS News reported "We developed these tools based on collaboration and inspiration from leading mental health experts and organizations, academics, our own extensive research and feedback from our community. We want the time people spend on Facebook and Instagram to be intentional, positive and inspiring. Our hope is that these tools give people more control over the time they spend on our platforms and also foster conversations between parents and teens about the online habits that are right for them." These new tools are available to use on the app today! Simply head over to the settings page and click "Your Activity" to see your unique time dashboard for time spent on the app. How much time do you spend on social media? Let us know in the comments section below. And be sure to subscribe to The Sitch for all the latest trending news.